The fundamental theorem of calculus is a theorem that links the concept of differentiating a function with the concept of integrating a function. The first part of the theorem, sometimes called the first fundamental theorem of calculus, states that one of the antiderivatives (also called indefinite integral), say F, of some function f may be obtained as the integral of f with a variable bound of integration. This implies the existence of antiderivatives for continuous functions. Conversely, the second part of the theorem, sometimes called the second fundamental theorem of calculus, states that the integral of a function f over some interval can be computed by using any one, say F, of its infinitely many antiderivatives. This part of the theorem has key practical applications, because explicitly finding the antiderivative of a function by symbolic integration avoids numerical integration to compute integrals. This provides generally a better numerical accuracy. The fundamental theorem of calculus relates differentiation and integration, showing that these two operations are essentially inverses of one another. Before the discovery of this theorem, it was not recognized that these two operations were related. Ancient Greek mathematicians knew how to compute area via infinitesimals, an operation that we would now call integration. The origins of differentiation likewise predate the Fundamental Theorem of Calculus by hundreds of years; for example, in the fourteenth century the notions of continuity of functions and motion were studied by the Oxford Calculators and other scholars. The historical relevance of the Fundamental Theorem of Calculus is not the ability to calculate these operations, but the realization that the two seemingly distinct operations (calculation of geometric areas, and calculation of velocities) are actually closely related. The first published statement and proof of a rudimentary form of the fundamental theorem, strongly geometric in character, was by James Gregory (1638–1675). Isaac Barrow (1630–1677) proved a more generalized version of the theorem, while his student Isaac Newton (1642–1727) completed the development of the surrounding mathematical theory. Gottfried Leibniz (1646–1716) systematized the knowledge into a calculus for infinitesimal quantities and introduced the notation used today. The area shaded in red stripes is close to h times f(x). Alternatively, if the function A(x) were known, this area would be exactly A(x + h) − A(x). These two values are approximately equal, particularly for small h.
For a continuous function y = f(x) whose graph is plotted as a curve, each value of x has a corresponding area function A(x), representing the area beneath the curve between 0 and x. 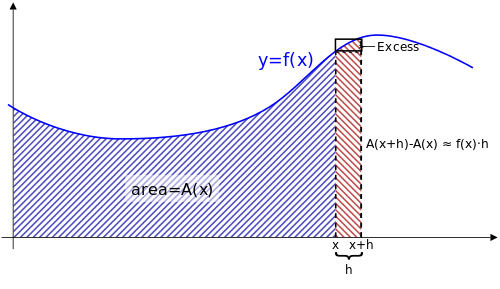 The function A(x) may not be known, but it is given that it represents the area under the curve. The area under the curve between x and x + h could be computed by finding the area between 0 and x + h, then subtracting the area between 0 and x. In other words, the area of this “strip” would be A(x + h) − A(x). This implies f(x) = A′(x). That is, the derivative of the area function A(x) exists and is the original function f(x); so, the area function is simply an antiderivative of the original function. Computing the derivative of a function and “finding the area” under its curve are "opposite" operations. This is the crux of the Fundamental Theorem of Calculus. Intuitively, the theorem simply states that the sum of infinitesimal changes in a quantity over time (or over some other variable) adds up to the net change in the quantity. Imagine for example using a stopwatch to mark-off tiny increments of time as a car travels down a highway. Imagine also looking at the car's speedometer as it travels, so that at every moment you know the velocity of the car. To understand the power of this theorem, imagine also that you are not allowed to look out the window of the car, so that you have no direct evidence of how far the car has traveled. Now imagine doing this instant after instant, so that for every tiny interval of time you know how far the car has traveled. In principle, you could then calculate the total distance traveled in the car (even though you've never looked out the window) by simply summing-up all those tiny distances. becomes infinitesimally small, the operation of "summing up" corresponds to integration. So what we've shown is that the integral of the velocity function can be used to compute how far the car has traveled. Now remember that the velocity function is simply the derivative of the position function. So what we have really shown is that integrating the velocity simply recovers the original position function. This is the basic idea of the theorem: that integration and differentiation are closely related operations, each essentially being the inverse of the other. There are two parts to the theorem. The first part deals with the derivative of an antiderivative, while the second part deals with the relationship between antiderivatives and definite integrals. This part is sometimes referred to as the first fundamental theorem of calculus. for all x in (a, b). The corollary assumes continuity on the whole interval. This result is strengthened slightly in the following part of the theorem. This part is sometimes referred to as the second fundamental theorem of calculus or the Newton–Leibniz axiom. The expression on the left side of the equation is Newton's difference quotient for F at x1. → 0 on both sides of the equation. The expression on the left side of the equation is the definition of the derivative of F at x1. To find the other limit, we use the squeeze theorem. The number c is in the interval [x1, x1 + Δx], so x1 ≤ c ≤ x1 + Δx. A converging sequence of Riemann sums. The number in the upper left is the total area of the blue rectangles. They converge to the definite integral of the function. need not be the same for all values of i, or in other words that the width of the rectangles can differ. What we have to do is approximate the curve with n rectangles. Now, as the size of the partitions get smaller and n increases, resulting in more partitions to cover the space, we get closer and closer to the actual area of the curve. By taking the limit of the expression as the norm of the partitions approaches zero, we arrive at the Riemann integral. We know that this limit exists because f was assumed to be integrable. That is, we take the limit as the largest of the partitions approaches zero in size, so that all other partitions are smaller and the number of partitions approaches infinity. , so the limit on the left side remains F(b) − F(a). and there is no simpler expression for this function. It is therefore important not to interpret the second part of the theorem as the definition of the integral. Indeed, there are many functions that are integrable but lack elementary antiderivatives, and discontinuous functions can be integrable but lack any antiderivatives at all. Conversely, many functions that have antiderivatives are not Riemann integrable (see Volterra's function). is differentiable for x = x0 with F′(x0) = f(x0). We can relax the conditions on f still further and suppose that it is merely locally integrable. In that case, we can conclude that the function F is differentiable almost everywhere and F′(x) = f(x) almost everywhere. On the real line this statement is equivalent to Lebesgue's differentiation theorem. These results remain true for the Henstock–Kurzweil integral, which allows a larger class of integrable functions (Bartle 2001, Thm. 4.11). In higher dimensions Lebesgue's differentiation theorem generalizes the Fundamental theorem of calculus by stating that for almost every x, the average value of a function f over a ball of radius r centered at x tends to f(x) as r tends to 0. This result may fail for continuous functions F that admit a derivative f(x) at almost every point x, as the example of the Cantor function shows. However, if F is absolutely continuous, it admits a derivative F′(x) at almost every point x, and moreover F′ is integrable, with F(b) − F(a) equal to the integral of F′ on [a, b]. Conversely, if f is any integrable function, then F as given in the first formula will be absolutely continuous with F′ = f a.e. The version of Taylor's theorem, which expresses the error term as an integral, can be seen as a generalization of the fundamental theorem. The fundamental theorem can be generalized to curve and surface integrals in higher dimensions and on manifolds. One such generalization offered by the calculus of moving surfaces is the time evolution of integrals. The most familiar extensions of the fundamental theorem of calculus in higher dimensions are the divergence theorem and the gradient theorem. Here d is the exterior derivative, which is defined using the manifold structure only. ^ a b Spivak, Michael (1980), Calculus (2nd ed. ), Houston, Texas: Publish or Perish Inc.
^ See, e.g., Marlow Anderson, Victor J. Katz, Robin J. Wilson, Sherlock Holmes in Babylon and Other Tales of Mathematical History, Mathematical Association of America, 2004, p. 114. ^ Child, James Mark; Barrow, Isaac (1916). The Geometrical Lectures of Isaac Barrow. Chicago: Open Court Publishing Company. ^ Bers, Lipman. Calculus, pp. 180–181 (Holt, Rinehart and Winston (1976). ^ Spivak, M. (1965). Calculus on Manifolds. New York: W. A. Benjamin. pp. 124–125. ISBN 978-0-8053-9021-6. Apostol, Tom M. (1967), Calculus, Vol. 1: One-Variable Calculus with an Introduction to Linear Algebra (2nd ed. ), New York: John Wiley & Sons, ISBN 978-0-471-00005-1 . Bartle, Robert (2001), A Modern Theory of Integration, AMS, ISBN 0-8218-0845-1 . Leithold, L. (1996), The calculus of a single variable (6th ed. ), New York: HarperCollins College Publishers . Courant, Richard; John, Fritz (1965), Introduction to Calculus and Analysis, Springer . Larson, Ron; Edwards, Bruce H.; Heyd, David E. (2002), Calculus of a single variable (7th ed. ), Boston: Houghton Mifflin Company, ISBN 978-0-618-14916-2 . Malet, A., Studies on James Gregorie (1638-1675) (PhD Thesis, Princeton, 1989). Hernandez Rodriguez, O. A.; Lopez Fernandez, J. M. . "Teaching the Fundamental Theorem of Calculus: A Historical Reflection", Loci: Convergence (MAA), January 2012. Stewart, J. (2003), "Fundamental Theorem of Calculus", Calculus: early transcendentals, Belmont, California: Thomson/Brooks/Cole . Turnbull, H. W., ed. (1939), The James Gregory Tercentenary Memorial Volume, London . Fundamental Theorem of Calculus MIT. Fundamental Theorem of Calculus Mathworld.